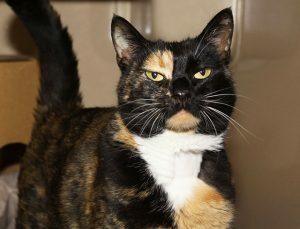 Stray cat Hope was in a critical condition when she arrived at our North Melbourne shelter in March. Suffering from a suspected snake bite, she was transferred into our care from an emergency vet clinic. “Poor Hope was in a very bad way. She was unable to move and had no feeling in her legs or tail. 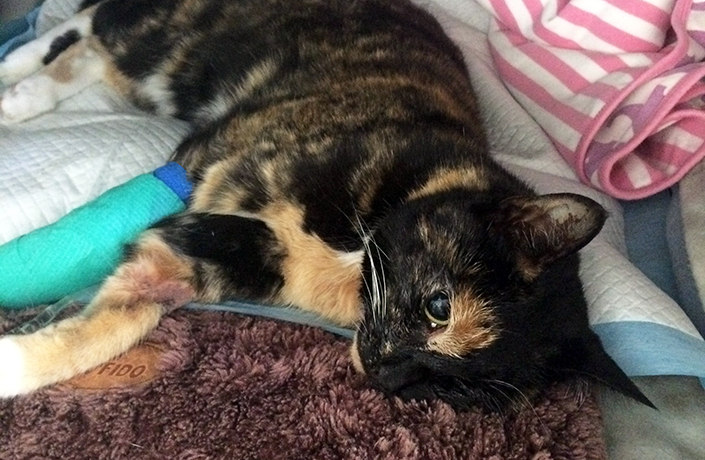 Her pupils were dilated and she couldn’t swallow,” said Amanda, cattery coordinator at the Home. Our vet team wasted no time tending to Hope to ease her pain and suffering, and give her the best chance of survival. Bright and happy, Hope is feeling much better. The sweet moggie is now ready to find a new home. “Hope is a very nice, outgoing cat who loves attention. When you bob down in front of her, she will hop up onto your legs and lean in for a scratch,” said Amanda. Hope (ID 1027633) is among the 50 felines currently up for adoption at the Home. If you can offer a loving forever home to a cat or kitten in need, view their adoption profiles or meet them at our North Melbourne shelter. Hope’s miraculous recovery was made possible thanks to the support of animal lovers like you. If you would like to support the life-changing work of our shelter hospital, you can make a donation here.